Britain up 1pc to 10.1m. Transatlantic is up 16pc to 4m. Asia, the Middle East and Africa is up 17pc to 1m. N Atlantic transfer passenger numbers are up 18pc to 1.8m. 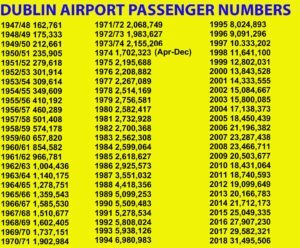 Dublin Airport reported 31,495,506 passengers in 2018, up 6pc. Originating and arriving passengers reached 29.4m and another 2.1m were transfer passengers (who were double counted, 1.05m bodies). Short-haul numbers are up 5pc to 26.5m, long-haul numbers are up 15pc to 5m..
Daa’s poroposed capital investment programme involves a €900 million capital investment programme to deliver new boarding gate areas, aircraft parking stands and many other significant improvements. The plan includes €200 million in airfield works and annual investment of €120 on repair and maintenance and revenue generating projects. Dublin Airport claims it supports or facilitates 117,300 jobs and contributes €8.3bn to the national economy.